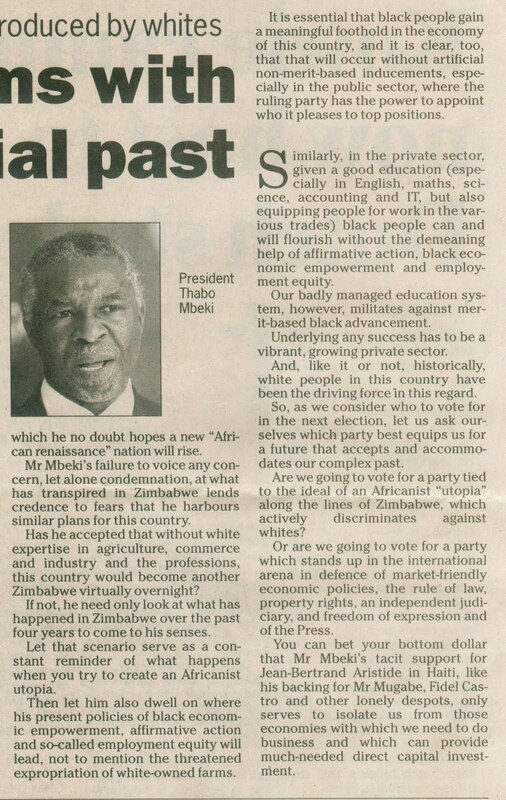 Thabo Mbeki's much-vaunted plan for an African Renaissance rang rather hollow in the light of his support for Robert Mugabe's destruction of Zimbabwe. 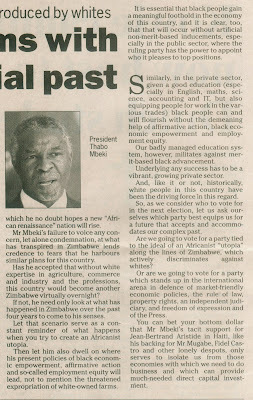 I tackle this issue in a feature published in the Herald, Port Elizabeth, in early 2004. 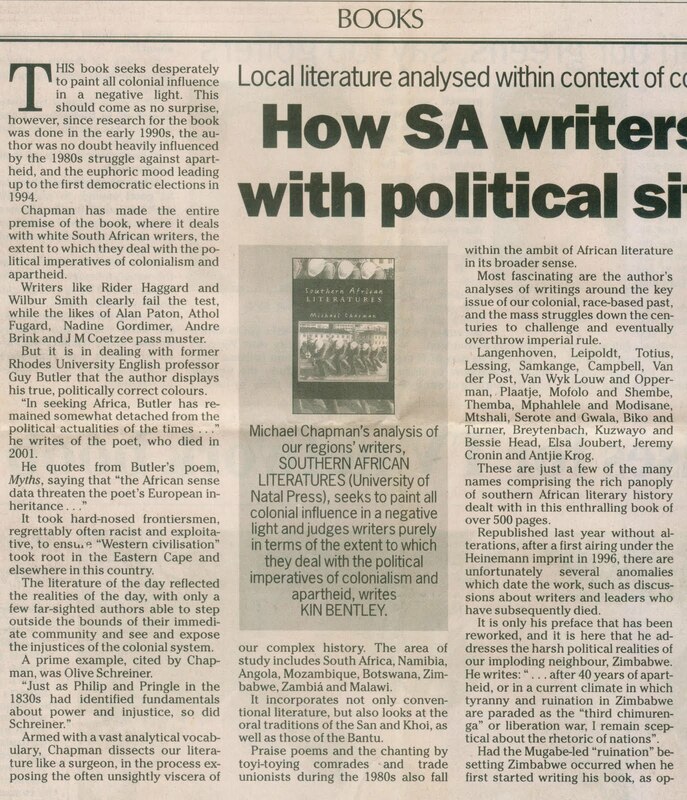 Also featured here is a review of a book on Southern African literature, a letter attacking writer Rian Malan in the Sunday Times, a look at Nelson Mandela's role in the creation of the new South Africa, and a letter querying why Mbeki was scared to face Tony Leon in a televised debate. 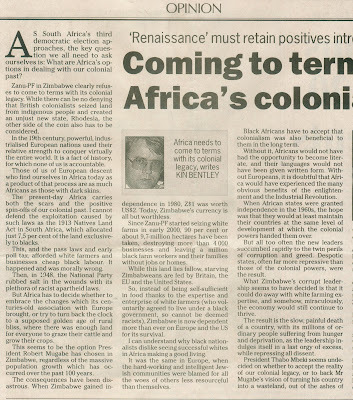 The conclusion to my piece on the African Renaissance. 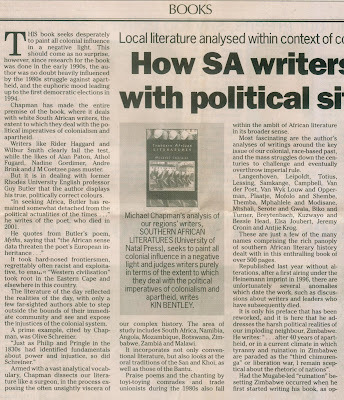 A review of Michael Chapman's Southern African Literatures, published in the Herald on February 4, 2004. It concludes below. The last bit of my review of Chapman's book. 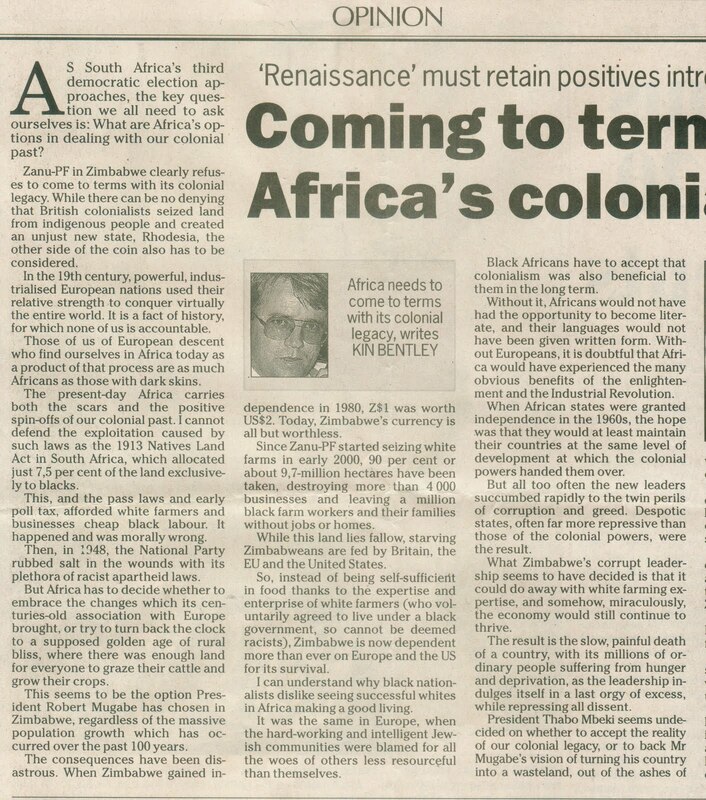 The Sunday Times devoted acres of space to an article by writer Rian Malan. 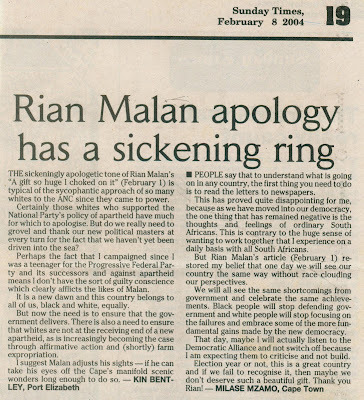 The following week, they published my response, along with another by a black reader who was obviously supportive of Malan. Ten years after the advent of non-racial democracy, I read through the key moments of Nelson Mandela's autobiography and discovered just what a pivotal part he played in bringing about the relatively peaceful transition. 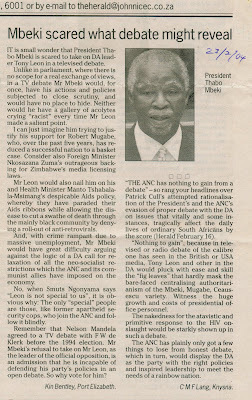 This was published on February 19, 2004. The article continues below. 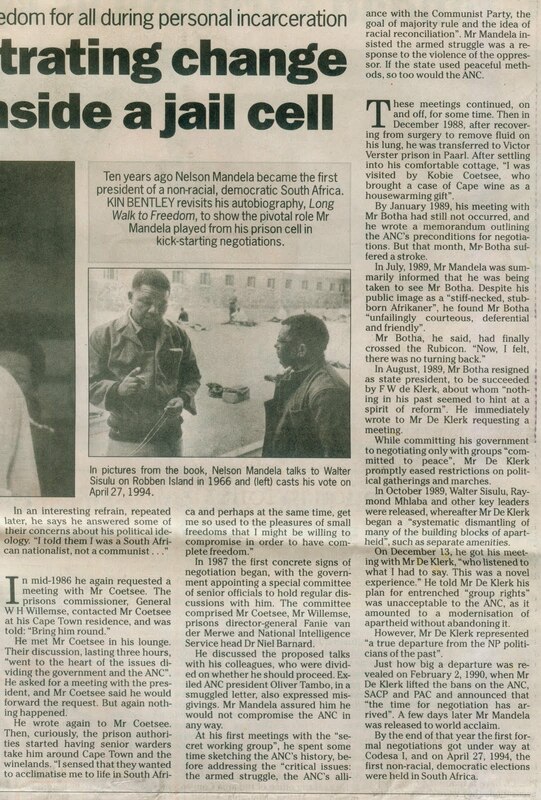 The concluding part of my piece on Mandela. 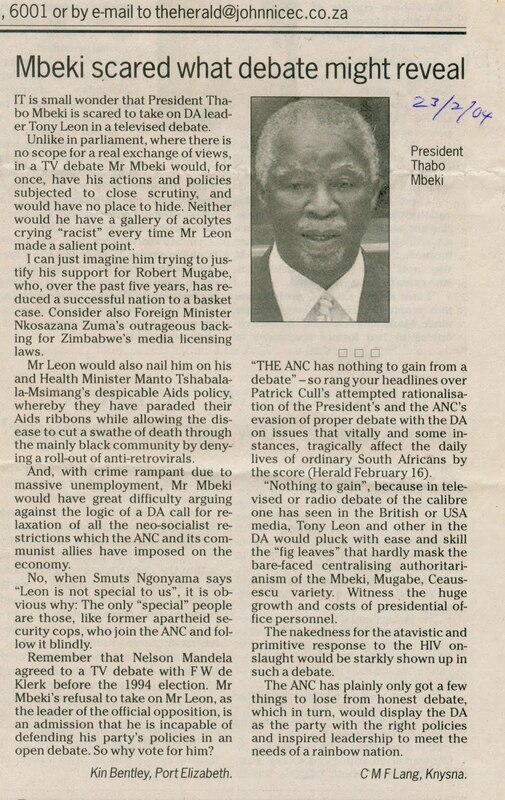 In this letter I question whether Mbeki has the courage of his convictions.